If you can’t tell from recent history, hair has been on the brain lately. With a refreshed hair cut and a little bit of color, it’s hard to not want to switch up your hair routine at least a little bit, right? I thought I’d share what I’m using on my hair lately, especially now that it’s getting much drier here and I really have to bust out the “good” stuff to keep hydrated. *These items were provided for me complimentary. No further compensation was received and all thoughts, as always, are my own. I’ve been wanting to try Morrocanoil products for so long! I’ve heard such great things about them. I’m really impressed with their shampoo and conditioner so far, and also have samples of a few of their styling products which seem to be great too! Nice list! Hate when you get a product you like then it stops working. Always nice to change it up but never know what next to try. And anything sulfate free bonus! Definitely – I try to avoid sulfates if I can, though it can be tricky! 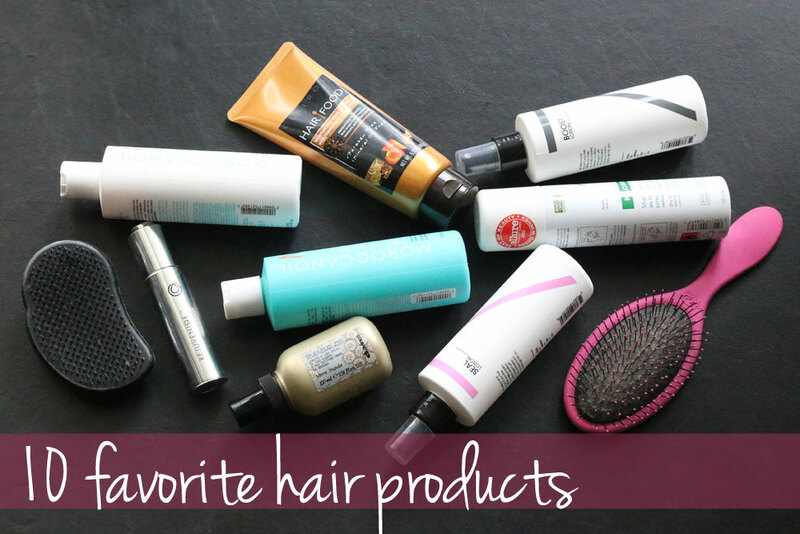 I have thick hair as well and it’s been a life saver on those little tangles. Works so much better than a big brush! I just got the moroccan oil shampoo in a beauty box and I can’t wait to try it out! Oh fun, I hope you like it! I also love the SEAL lotion from SEVEN! And I’ll have to try your dry shampoo rec…I only wash my hair once or twice a week so I really need to start using some! I use Moroccan Oil too. I started using it years ago because I fell in love with the smell but it does amazing things for my hair too. However….I recently switched to a new shampoo and conditioner that does even better for my hair. Living Proof. I’m thinking about doing a post on it soon to review it. It’s the first shampoo I’ve used that totally lives up to ALL of it’s promises. Amazing but way expensive. Worth it to me though. My hair has been extra frizzy lately, so I think it’s time to try some new products and mix things up. Thanks for these suggestions! I’ve looked at the Moroccanoil products a few times so it’s nice hearing another positive review! One of these days I’ll have to treat myself. I just wrote all of these down! Between myself and my daughters, we need hair help… well, maybe not the newbie, but my toddler has crazy curls but thin hair and me… let’s not get started! Thank you for all the ideas- I will be masking this hair and then taming it in no time! I didn’t even realize they had body lotion – I will definitely check that out! So many products, so little time! I love Morocan oil’s products, they are honestly the best! I’m definitely loving them so far – glad you like them too! Great list! I need to try some new hair products. I need to get some of these for my really insane hurr. Haha, you’ll definitely have ot let me know if you try any of them! Great picks! I love my wet brush! Thanks Megan, the Wet Brush is a life and time saver! Thanks Myrabev, so glad Moroccanoil has worked for you too! What a fabulous list!!! I use a Sea Salt Spray (not the same brand as you, I use Not Your Mother’s), but I just love it!! I’ve heard good things about the spray from Not Your Mother’s too! I’ll have to check that one out when I run out! Gosh, I’m so useless with my hair. Shampoo, conditioner and a good blow dry are all I use – I know I need to look into using more heat protection treatments though! I swear that if Moroccan hair products were to cease to exist I might die. I LOVE those products. Expensive as hell, but oh so worth every drop. Glad to hear they work so well for you! So far I’m still really impressed too! Moroccan oil is awesome! I use that in conjunction with RedKen serums to protect hair from heat treatment (e.g. drying, curling) and to improve hair glossiness. And then since I have color-treated hair, I apply a mask every week or so to help it regain its shine. Your routine sounds awesome, Lauriel! I’m definitely going to look into the Redken serum! 8 (omg I have a lot more than I thought I would)Hair straightener? Does that count? Loving your list! I’ll have to check out the Aveda Anti-Humidity Balm… definitely need that in the Seattle rain! I also will check out the Principessa dry shampoo – haven’t heard of that before! Nice list. I want to try that sea salt spray.